The kids will love it…including the ones who haven’t really grown up yet: A train ride and a little history. When 27 historic sites and museums across the county open their doors to the public on October 17 and 18 for Union County’s Four Centuries In A Weekend, a number of sites can be easily visited by train. A number of historic sites in Union County are within easy walking distance of NJ Transit rail stations and on the Raritan Valley line, shuttles will provide free connecting rides from two stations. 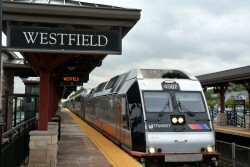 The Town of Westfield, in cooperation with the Union County Department of Parks and Recreation, will provide a shuttle bus from the Westfield station to the Deserted Village in the Watchung Reservation, with stops at the Miller-Cory Museum, the Reeve House, and the Deacon Hetfield House. From Union Station, Kean University will provide free trolly rides to Liberty Hall, which like all sites, has waived any admission fees for the weekend celebration. Kowalski said the other advantage is that for visitors from out of the area, or for those who rely on mass transit, it will be possible for the first time to visit so many sites over the Four Centuries weekend. “The train ride adds to the fun of learning about our area’s incredibly rich history. There was a lot going on here long before America even declared independence,” she said. For families, there will also be some savings because NJ Transit allows children to ride free on weekends. Monthly commuter passes are also valid. Fare details are available at njtransit.com. –Roselle Park. Walk south on Chestnut Street to the borough’s downtown and you will find the Roselle Park Museum at 9 West Grant Ave. A little further, on Westfield Avenue, was the Charles E. Stone store, the first store in the world illuminated by Thomas Edison’s incandescent lamp. On the Northeast Corridor Line, there are a number of other possibilities. Utilize Penn Station Newark to transfer from the Raritan Valley Line to the NE Corridor line. –Elizabeth: From the Station and head north on Broad Street. Several major historic sites are an easy walk, including the First Presbyterian Church of Elizabeth & Snyder Academy at 42 Broad Street and the Boxwood Hall State Historic Site, 1073 East Jersey Street. Exit First Presbyterian to the left head to E. Jersey. Make a right onto E. Jersey and follow to 1073 E. Jersey. — Summit: Summit Playhouse, at10 New England Avenue, is just west of the station. The Summit Library Association kept its books in various locations until residents donated $3,720 to build the Richardsonian Romanesque structure designed by Arthur Jennings. Twin Maples, located at 214 Springfield Avenue, is just east of the station. Twin Maples, with its “White House” presence, is a suburban estate typical of those built in the Summit area between 1880 and 1920. For more information about Four Centuries in a Weekend visit ucnj.org/4c.